Designed by James Pianka. Published by Predicate. Kickstarting in 2014. For 3-5 players. Copy provided by Publisher. Language games - those which try to cater to those abecdarians with a desperate love of words - are often a hit or miss experience. They tell stories, but not quite the right ones, or cater to someone's vast vocabulary and system mastery at the expense of others' clever wits or goofy jokes. 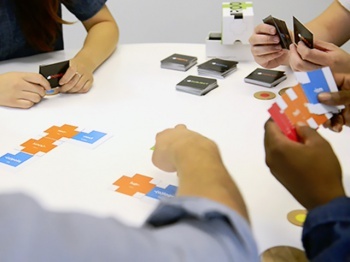 Roots, a card-based language game playing on the idea of building words from English prefixes and suffixes, then giving them crazy or clever definitions based on a common theme. Like other party games, you can easily dial this game from genius to crude, sophisticated to cute, depending on the group you're with. It's fun and surprisingly deep, and has deceptively pretty graphic design to boot. The game is a little overdesigned at times, though, and sometimes you just wish it would get out of the way and let you play. 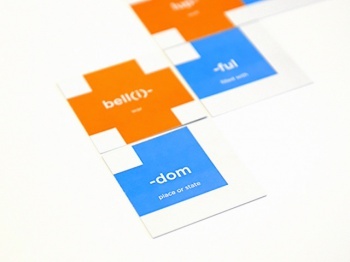 Each round of the game, each player puts out a card that has either a prefix or a suffix, then uses it in combination with the other cards it's attached to in forming a word. They then explain how that word is defined, and try to relate that definition to the theme or subject card for that round. At the end of each round, players anonymously vote on whose word was the best using a handful of voting tokens. The winner gets the subject card, which has a few symbols on it. Those symbols match up to a secret win condition that each player has, and once a player has their set of victory conditions the game is over. Those victory conditions can be occasionally frustrating when the cards just aren't in your favor, but they really just serve to give the game a timer. They're really basic mechanics and most folks understand them right off the bat - you can only read words the way we read them in English, so left to right or top to bottom, and it takes only a few moments to explain the rules for placing things and get playing. From there, it's a typical party game experience: Easy to learn, fun to play, and basically scalable for any kinds of players - though younger kids will have trouble with the word construction. You'll do goofy things like throw down the root "luna" before the root "cracy" to describe the powerful government that will one day rule the world from the moon. Your opponent will build on it by putting "pan" before it - to form "Panlunacracy" - the super-government that controls the solar system by ruling its moons. And so on, and so forth. The creation of words is so much fun that you'll find yourself not minding when you get one-upped by a clever combination - Roots has many, many moments of "I'm not even mad. That's amazing." All of this is complicated by the power cards that you employ - and many players will be of mixed mind about this element of the game. Powers let you do things like break off trees of words into new combinations, create a new tree, or cycle cards out of your hand. More frustratingly, they also let you do things like steal cards from opponents' score piles or negate another's power use. They're interesting fodder for smaller games, but once there are more than three people they start to feel like a vestigial element that only serves to make the game "more like a game" instead of really keep the game moving and fun. Worse, sometimes they're simply fun killers, where you're playing them to ruin another's creative word you know you can't out-think. That said, they can occasionally build good gameplay and the better of them keep the game from getting stale. Roots is a brilliantly fun game, with tons of replay, and I'm already ready to go in for an expansion with more cards, and more fun, already. As a fan of language games, this is an ur-example for me, filled with potential hours of fun. While at times the game design is weird and, quite simply, too structured, it redeems itself with the crazy combinations you can make and the fun you'll have torturing the language into shape. It's greatest flaw is that I can't play with more people than I can right now. Maybe shuffling in another set will fix that. Roots is available now via Kickstarter. Bottom Line: While at times it gets slow, a crew of clever players will make hay with Roots. Recommendation: Like any other language game, you know if you want to make up goofy words and clever combinations or if you'd prefer to be trading sheep and killing goblins. If you like words, though, you can't do much better than this.